Last night there was an AMBER warning for weather. I was not sure what that meant but the non-stop torrential, lashing rain and the wild gusting winds might be the most wretched rain I have ever experienced. I have been in a lot of rain. I am sure that I have been in worse rain but this felt bad enough. Now I have spent all morning moving more things out the way way of fresh drips and and puddles. Nothing can be done to solve the leaking in this weather. We can only wait. It is good that the floors are made of stone. The ceilings are another matter. It is good that we read a lot of newspapers. It is not good that I delivered nine big bundles to the dog sanctuary last week. I am going through the remaining supply of paper for soaking up the water fast. I hope the rain stops before I run out. I have every straight edged container I own snicked up tight against walls wherever there is a leak. It is time to stop talking about this. I cannot stop living with it but I can stop pretending that my descriptions will help in any way. The rain is not stopping. The farmers are getting more and more worried. They are running out of fodder for the cattle. The Tipperary farmers cannot help out the farmers in the midlands and in the west as they usually do in a crisis. 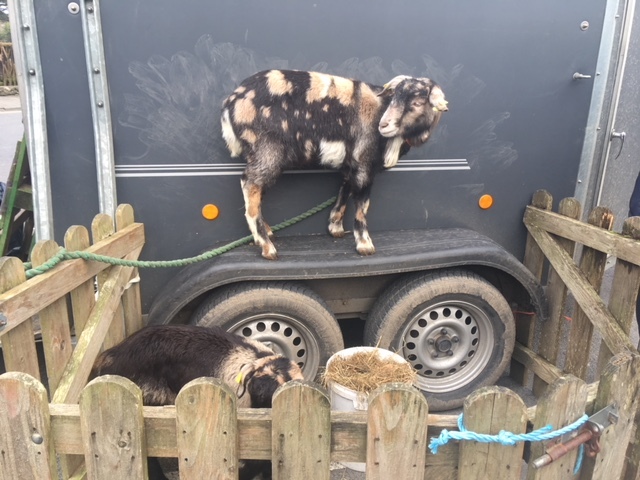 They cannot help because they need help themselves. We all need help. All of the repairing of our roof and our leaks has become something much worse than it was before. There is water flowing through the fuse box and down the wall in the kitchen. I have moved every single thing off the coat hooks and off the little racks down below. There was a row of seven small framed things above the coat hooks. The frames are soaked and the things in them are soaked. I enjoyed studying the wet things as I tried to dry them and to save them. It is easy to stop looking at things when they become familiar. Moving a thing from one place to another makes it new again. Which is nice. 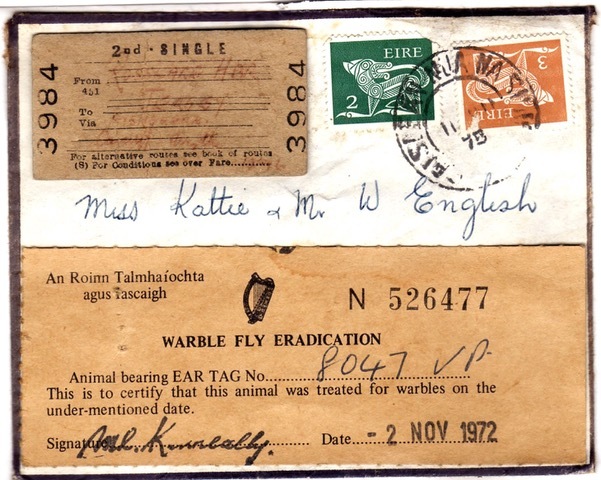 The warble fly certificate and a small envelope addressed to Kattie and Willie is among the things that I am drying out. The seven frames are lined up underneath a radiator. Kattie’s name was not Kattie. Her name was Kathleen or maybe Katherine but everyone called her Kattie. Probably Kattie was a pet name which began when she was a child and it just stuck. Maybe the family thought of her as a little kitten kind of person. Kittie. Kattie. Maybe indeed it was supposed to be Kattie but there is an ongoing problem here with the pronunciation of TH. TH often sounds like TT. When I first came here, if I mentioned Kattie, I would automatically adjust it to say Kathie. If I said Kathie someone would always correct me. The correction would be gentle because I am From Away and because of course I never actually knew Kattie. Kattie English lived in what is now our house with her brother Willie English. At one time, there were two older siblings, Frederick and Elisabeth, living here too. Frederick and Elisabeth died years before Willie and Kattie. But they all died well before we came here. Increasingly the people who knew Kattie and Willie themselves are dying or have already died. There are few people now who would notice if I called Kattie Kathie. Even so my correction of her name to be what I think it should be rather than what everyone knew it to be is a little bit arrogant. If I speak of Kattie at all I should use the name that she was known by, not the name I think it started from.